Pets are naturally drawn to the water especially some breeds of dogs. 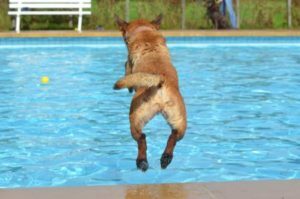 In most cases, dogs won’t harm the pool’s surface meaning plaster or pebble tec structure but they can have an adverse affect on the water and the quality of it. Hairy dogs will shed fur that will eventually end up on the surface of the pool and then go into the baskets and the filter tanks restricting filtration and cause for extra maintenance of those items. Dirty dogs will shed dirt and oils, and bring phosphates into the pool, which affects the pH and creates a sanitizer demand and can cause for algae issues. Heavy use, or many dogs in a pool may require pH adjustment and shocking, along with extra filtration to restore water clarity. One dog in a pool is the same as 10 people so it can cause a lot of issues with the water chemistry. Unfortunately thousands of pets drown each year in backyard pools most go unreported, so there is no reliable data on how many pets are lost. 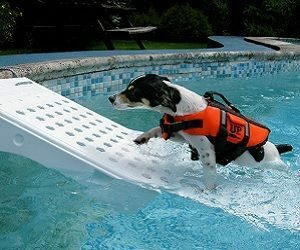 You can add a pet ramp or exit steps to a pool to help them get out as a precaution. Pet drowning most often occurs with very young and untrained dogs, but also to old and weak dogs. A pool fence can be a good deterrent to keep pets away from the water. Many dogs love the water and it can be a lot of fun for the pet and the pet owner but the above should be considered. ← Aqua-Rex water conditioner for swimming pools.